So it’s been said that I enjoy working on improving my shop. But I’m sure that I speak for a great many men and women who have that place they call their creative space, that there is always room for improvement. 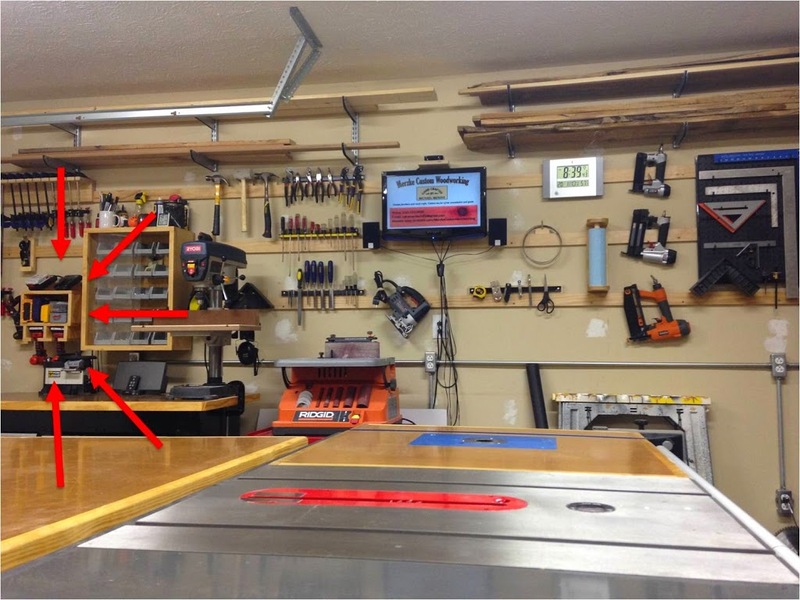 For me that creative space is my garage… my shop. I am always analyzing my work flow and shop organization to make sure that it is optimum. Well optimum might be a moving target that changes from time to time. Well today my drills and its place in the shop seem to be the subject of my current improvements. 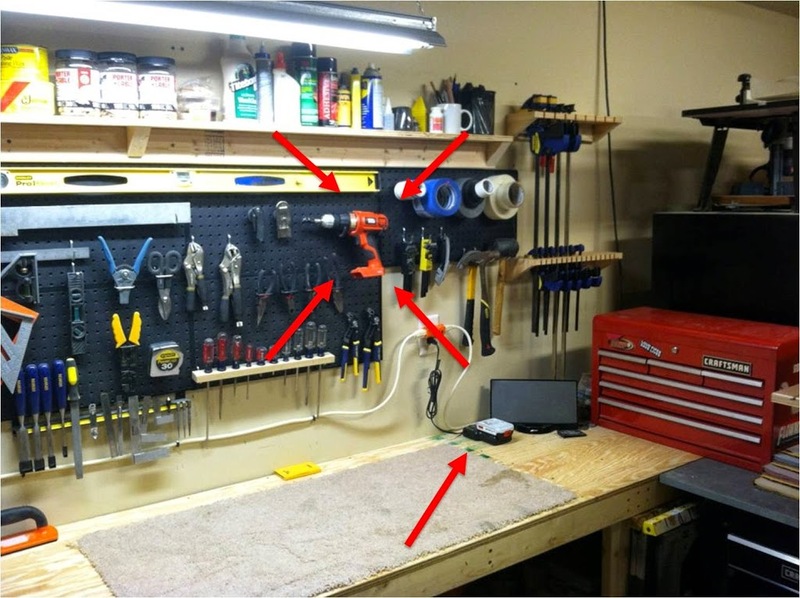 At one point in a shop setup from awhile back my single drill hung on a peg board on the wall with the charger on the workbench below it. This seemed to work and it was always handy. But then my shop started to grow and morph closer to what it is today. With that growth I found myself the owner of not only one drill but two. 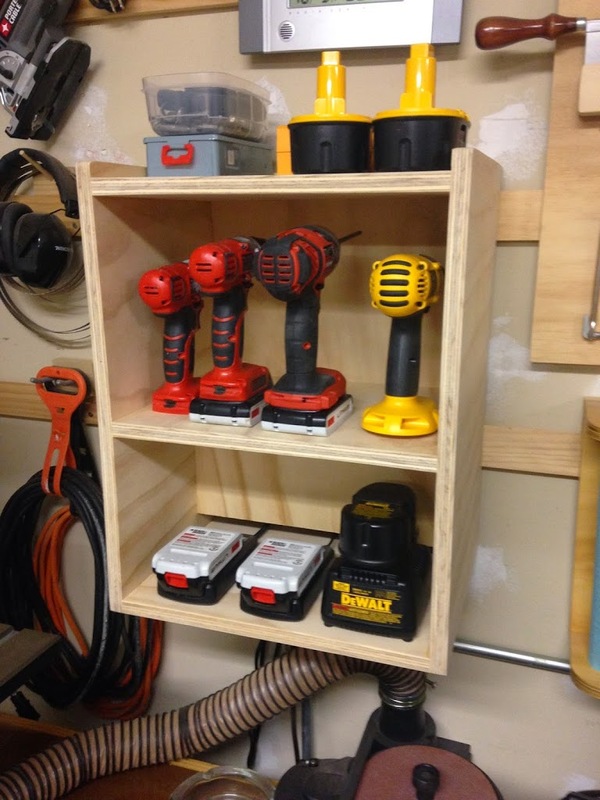 This not only helped with my work flow but also gave me the chance to build a drill charging station. This small piece of shop furniture seemed to work great for quite awhile… well that is until I picked up a cordless hammer drill and an impact drill. Now with twice the drills I had storage space for I had to take action. So off to sketchup I went. 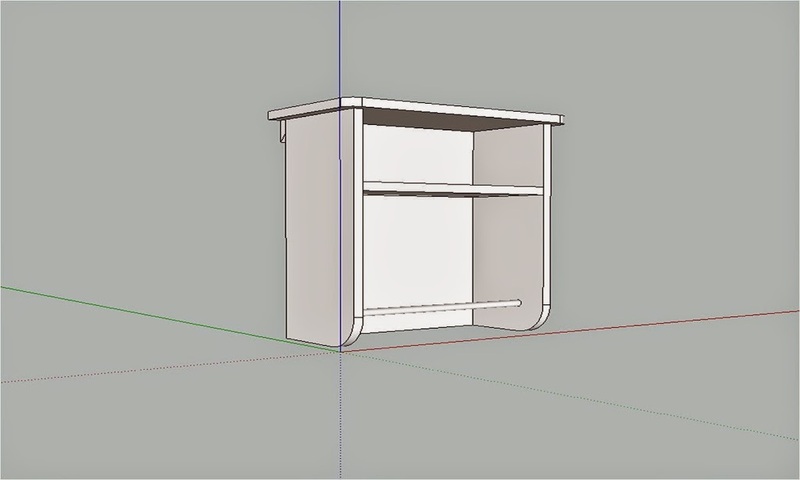 I quickly drew up a small cabinet that would hang on my french cleats with a dowel that would hold the drills and a shelf for batteries and drill bits. I had a good amount of scrap pieces of 3/4″ pine plywood from previous projects so off to the shop to make some sawdust. After a few hours I had a new home for my drills. The only issue was that the smaller drills weren’t very stable balanced on the dowel and the back of the cabinet. By then next day I realized that this was going to cause issues and possibly damage my tools if they drop. Back to drawing board… or I guess to the computer to play around on SketchUp. 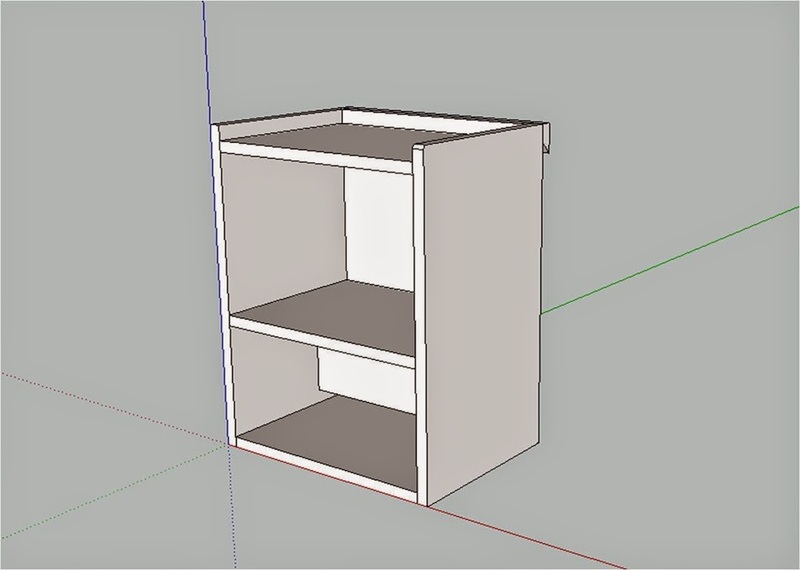 This time it would be a simple cabinet with the lower shelf for the chargers, a middle shelf for the drills, and the top of the cabinet for drill bits and batteries. I made the dimensions just big enough to work without taking up any more of my limited wall space than needed. Now back to shop to slap it together. 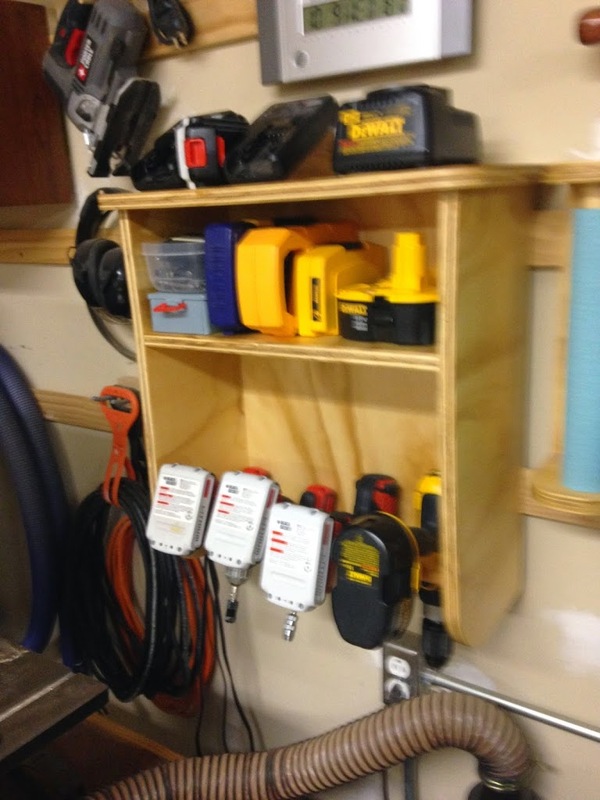 So now I have drill charging station 3.0 which is the fourth and probably not the final resting place of my drills. I did however decide that I wouldn’t apply any finish till I made sure it was going to stick around for a little while. I think the same thing that drives us to build and create with our tools and shops also drives up to build and create for our shops and tools. The challenge is finding that balance between the two. ← My woodworking adventures in Boston!